Fernando serves Maka his first spoonful of banana baby food. He ate sitting up just like a baby as Fernando fed him a snack of banana baby food from the jar with a metal spoon. And he ate it fast because he LOVES human baby food. 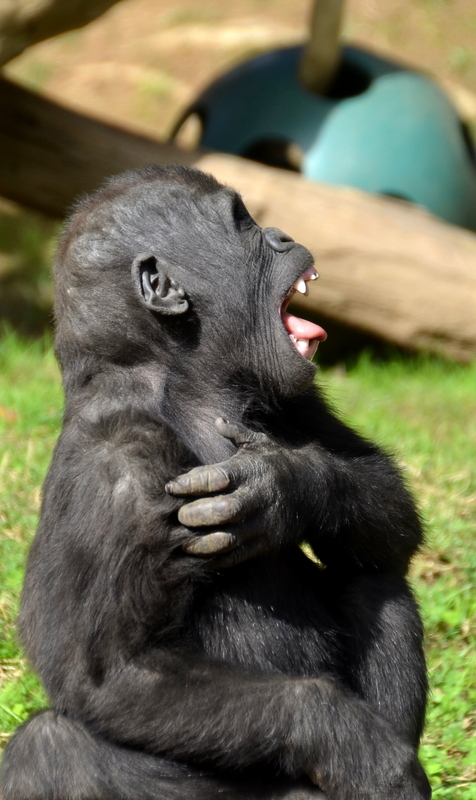 But, instead of being a baby, he is an silverback adult male Western Lowland Gorilla named Maka living at the San Diego Zoo, California, United States of America. He opened his big pink mouth full of big white teeth and ate each spoonful in an instant. 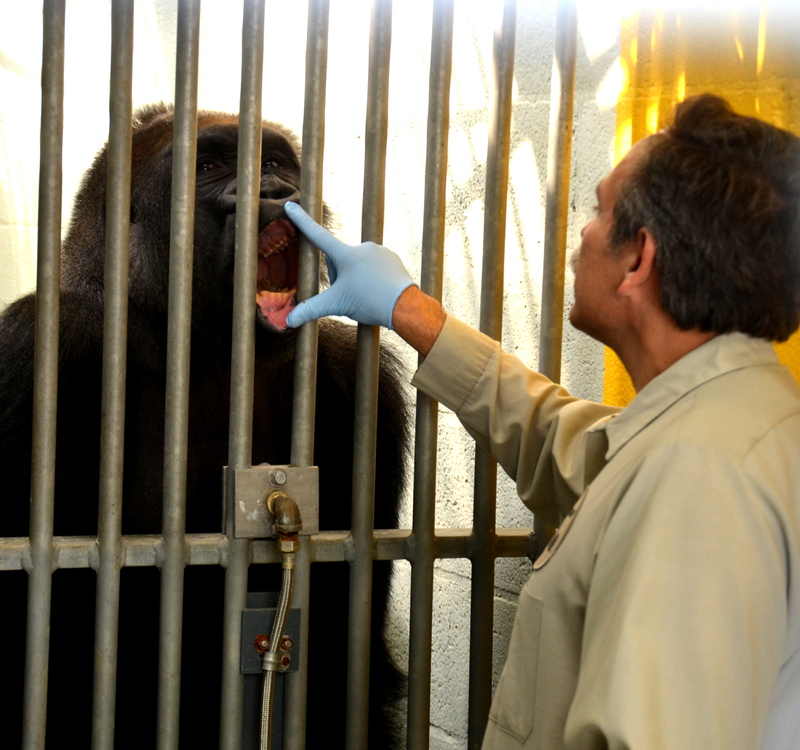 Fernando Covarrubias, a gorilla keeper for 30 years at the San Diego Zoo, cannot feed Maka fast enough. And if he stops, Maka knocks on his bedroom door or wall for more. Maka has 98% DNA of a human yet he is a gorilla with 2 chromosomes from being human. 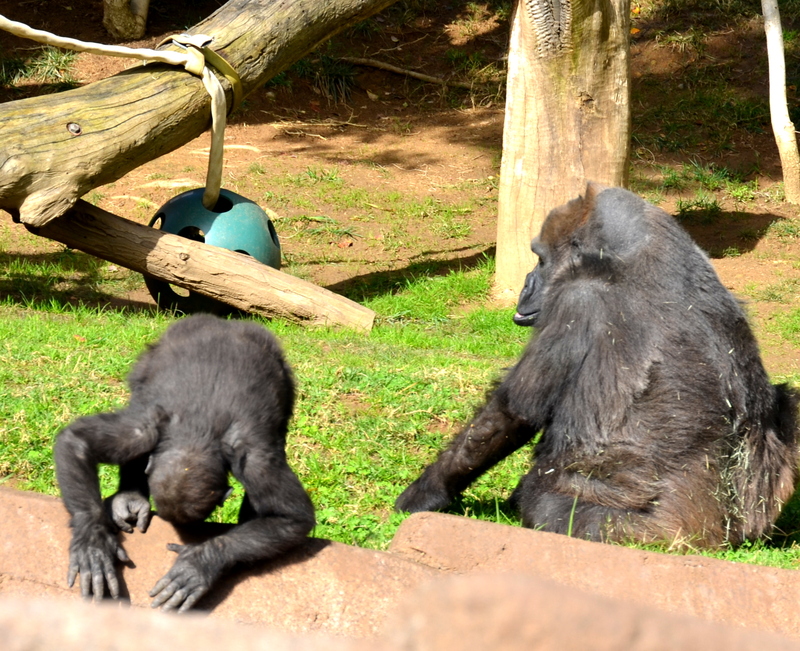 All gorillas have access to the open air yard, and are rotated on exhibit and off exhibit throughout the day. 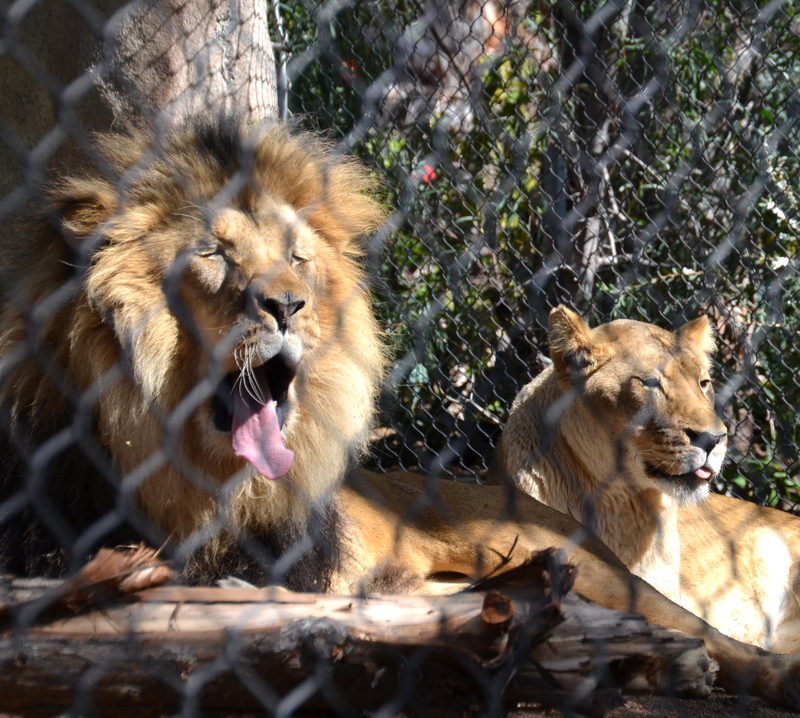 When they are off-exhibit in their bedrooms, it gives keepers a chance to check their health and work on training. Maka waiting for another bite of baby food. Many times, Fernando explained, vitamins and needed medicines are mixed in the baby food to keep Maka healthy. And Maka always takes his meds because he loves his baby food so much and he doesn’t even wear a bib or get one drop of food on his beautiful black hair or his body. 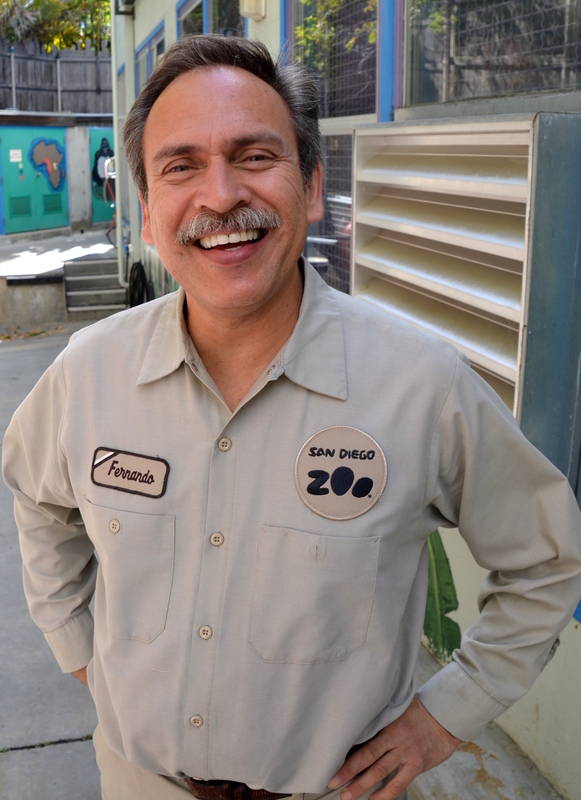 Fernando, keeper of gorillas for 30 years, at the San Diego Zoo. 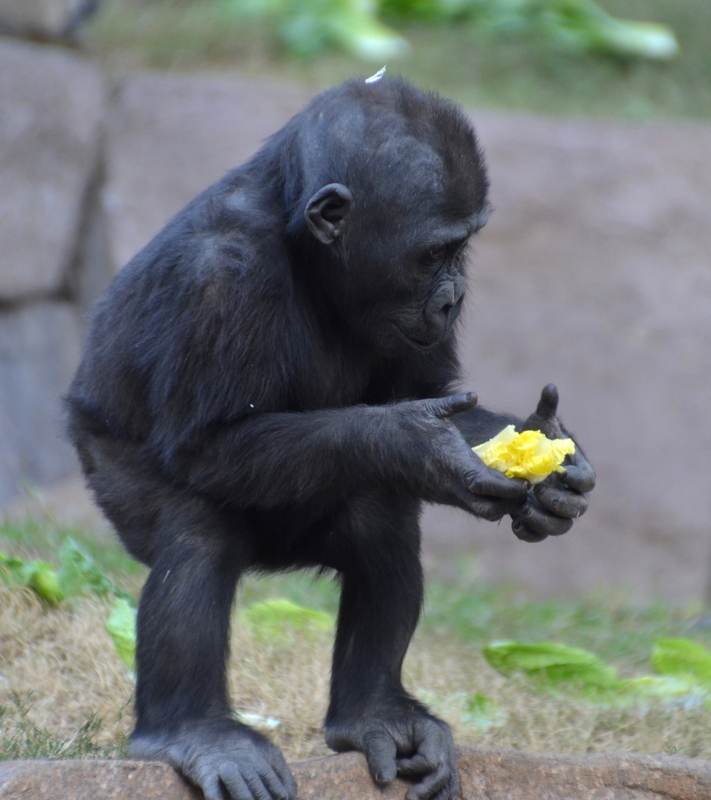 For their main nutrition, Fernando gives each gorilla daily biscuits full of plant matter and vital nutrients because gorillas are leaf eaters. These biscuits are formulated to be like the nutrients gorillas eat in the wild. As the gorillas eat their biscuits each morning, they are kept separate so Fernando will know each one is getting complete nutrition. 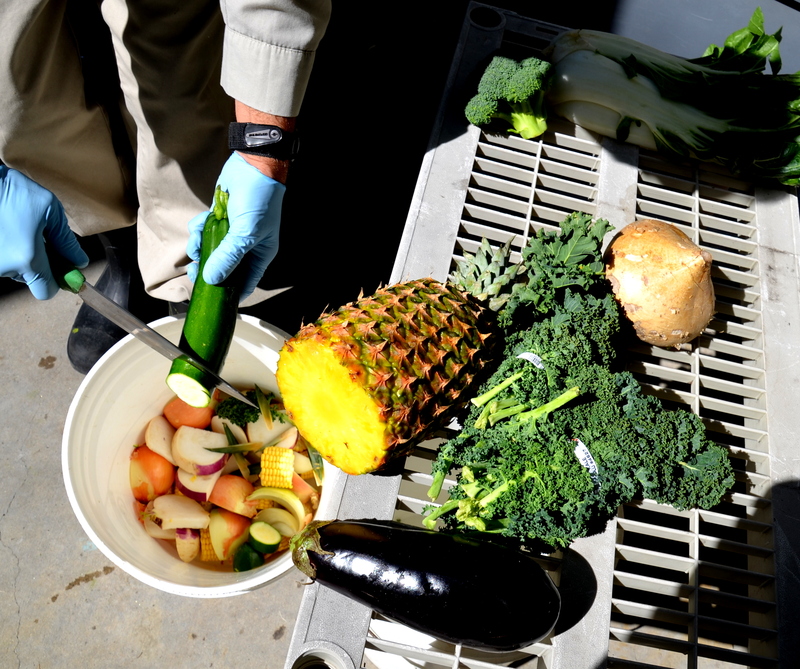 Now it was time for different vegetables and fruits like bananas, apples, figs and plant-based foods they feed the gorillas. Between the bite-size fruit treats, Maka showed how he communicates with Fernando. “Show me your left ear,” Fernando said, and Maka showed his left ear through the bars in his bedroom. “Show you right foot,” and Maka lifted his huge right foot into Fernando’s hand so he could check it out. Maka shows his ear for examination by Fernando. Next, Maka stuck his left hand out and Fernando held his hand and examined it. It was the cutest big plastic-looking hand with huge fingers twice the size of a male human adult’s. 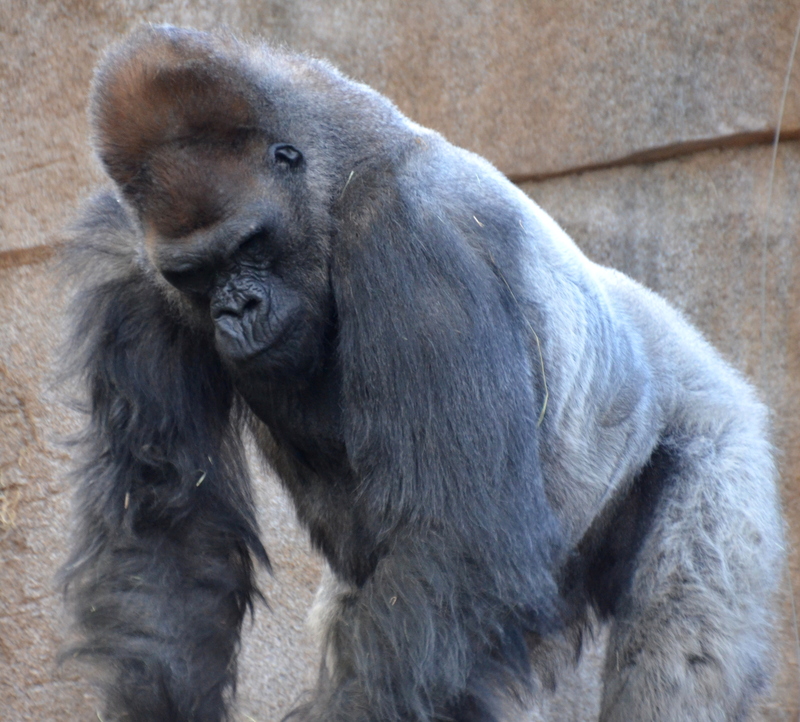 “Turn around and show your back,” and Maka showed his beautiful silverback so Fernando could look at it. “You are good to go for today,” Fernando told Maka, as he had just completed his daily medical exam. 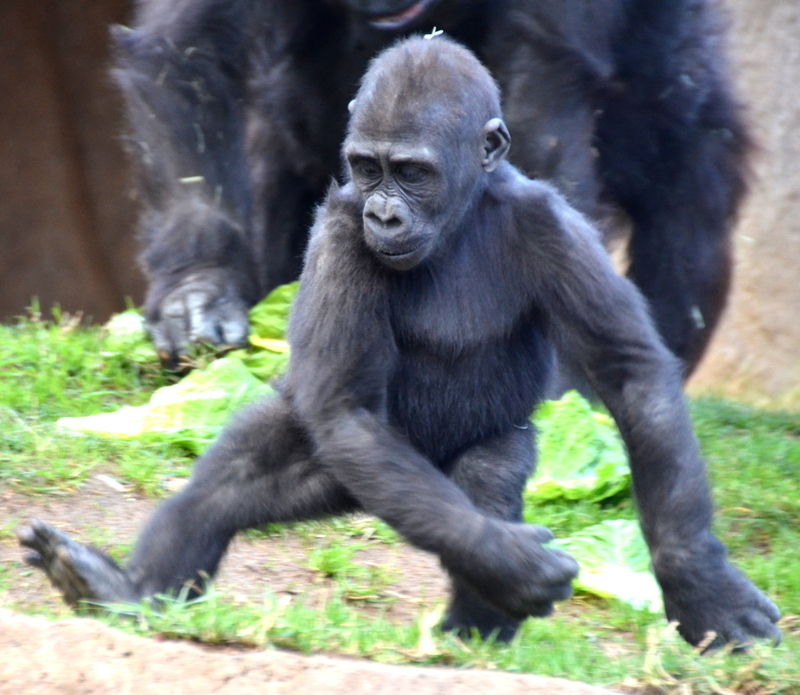 While all of this was going on at the San Diego Zoo, 20-month old Monroe was romping, tumbling, rumbling, running and eating carrots for all the visitors to see at the San Diego Zoo Safari Park where he was born June 17, 2011. In a second, he would be riding the back of his surrogate great-great-grandmother, Vila, for a few feet and then she would put him off. Vila died January 25, 2018 surrounded by her gorilla family group. 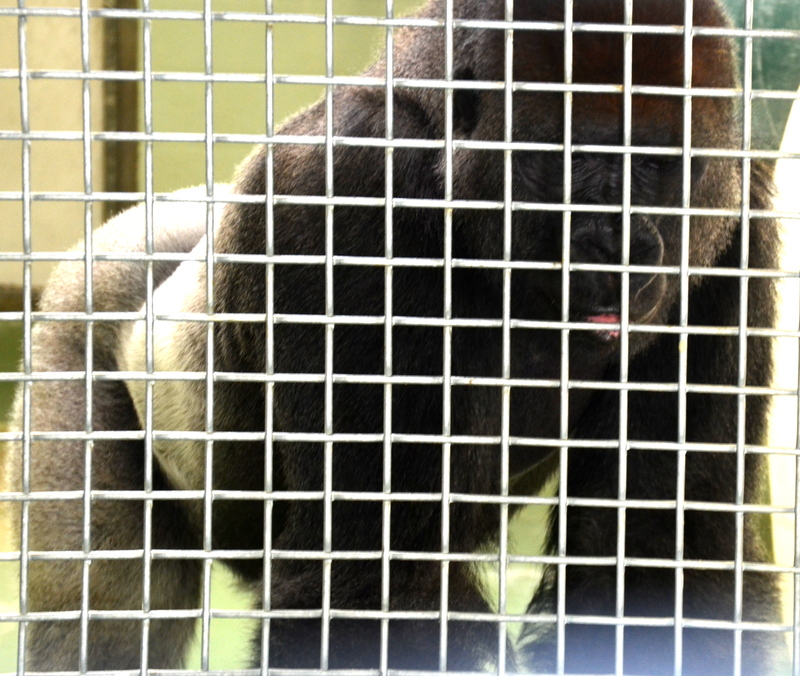 She was 60 years old and the second oldest lowland gorilla in the world. 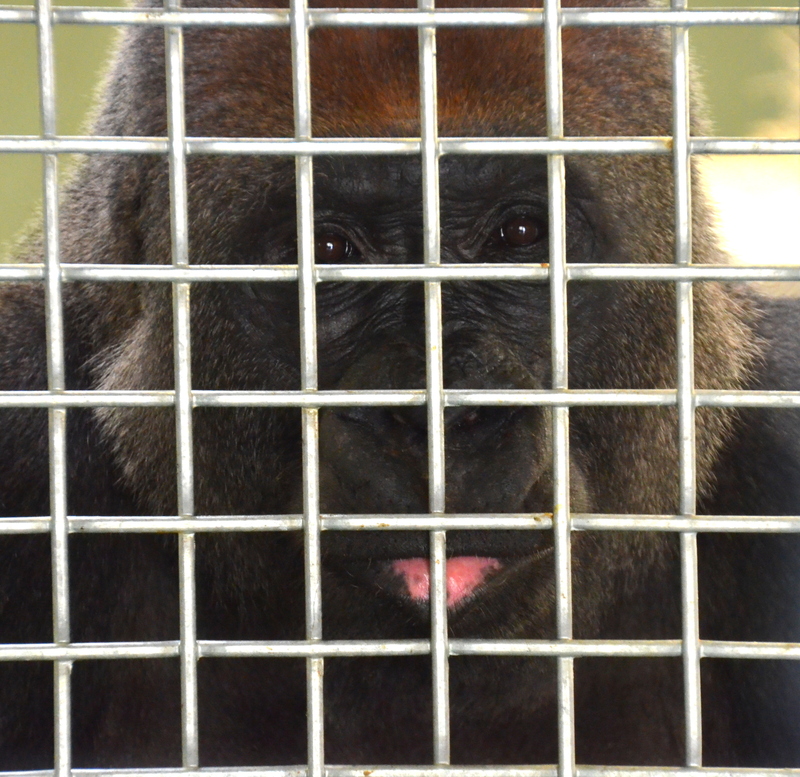 Vila held the record as the second oldest gorilla in the world living in captivity. when Monroe was nearing his terrible two’s, most of the adults in the gorilla troop don’t want to run and play full time with Monroe. Monroe eating s snack on the run. Enter Frank, a 4-year-old gorilla from another gorilla family troop at the San Diego Zoo, as a potential playmate for Monroe”, Peggy Sexton, lead keeper in the Mammal Dept. at the San Diego Zoo Safari Park explained. 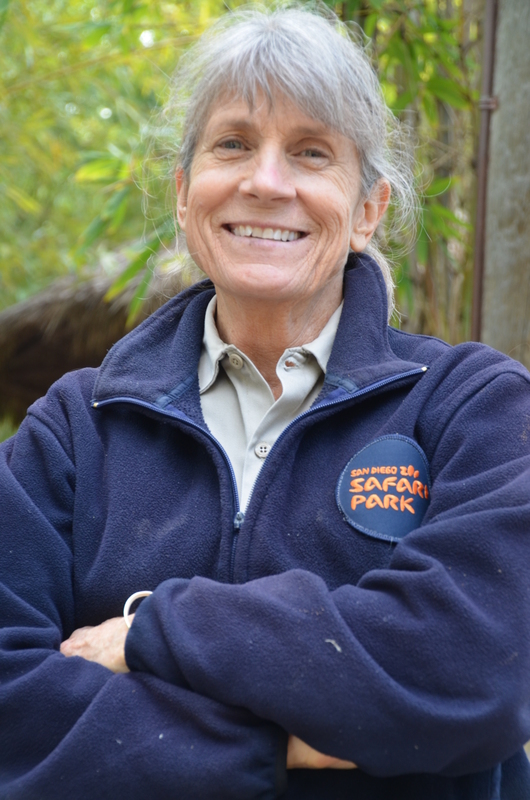 Peggy Sexton, lead keeper in the Mammal Department at the San Diego Zoo Safari Park. “We’re bringing Frank and Monroe together so they can be together throughout their lives in a bachelor troop, if necessary, and it is best to introduce them as youngsters. Monroe and Frank, being from different troops, however, are getting to know one another as they visit through bars in their adjoining bedrooms. 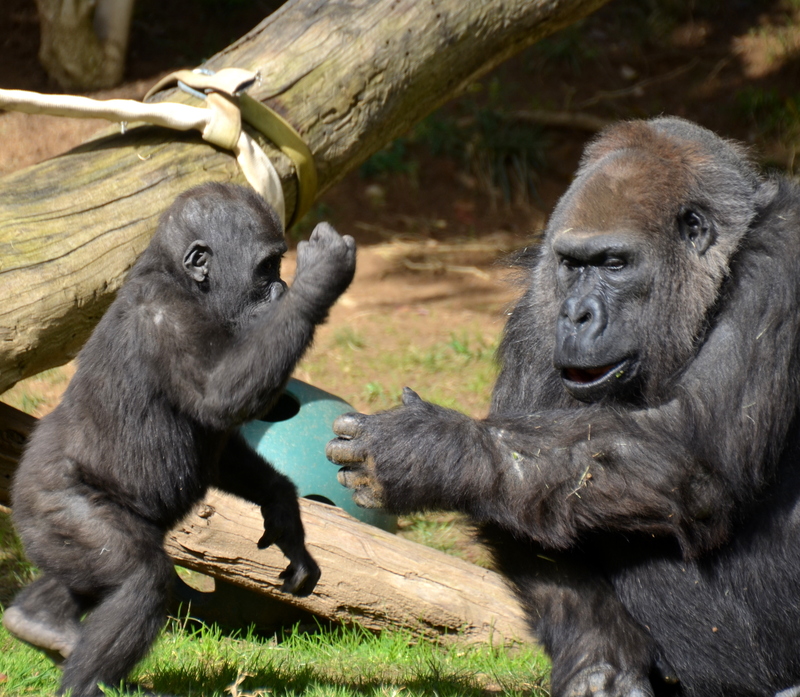 Smelling, watching, touching, running back and forth, and playing is helping to bond these cute little gorilla children together so they can eventually grow up together in the same troop. After a careful introduction period, they were brought together in the same exhibit to run, play and have disagreements just like real brothers while the older adults continue to sit and watch. Vila,the great-great grandmother and Monroe continue to be best friends. Another one who doesn’t run and play much is Winston, the dominant silverback male, born in the wild in West Africa. 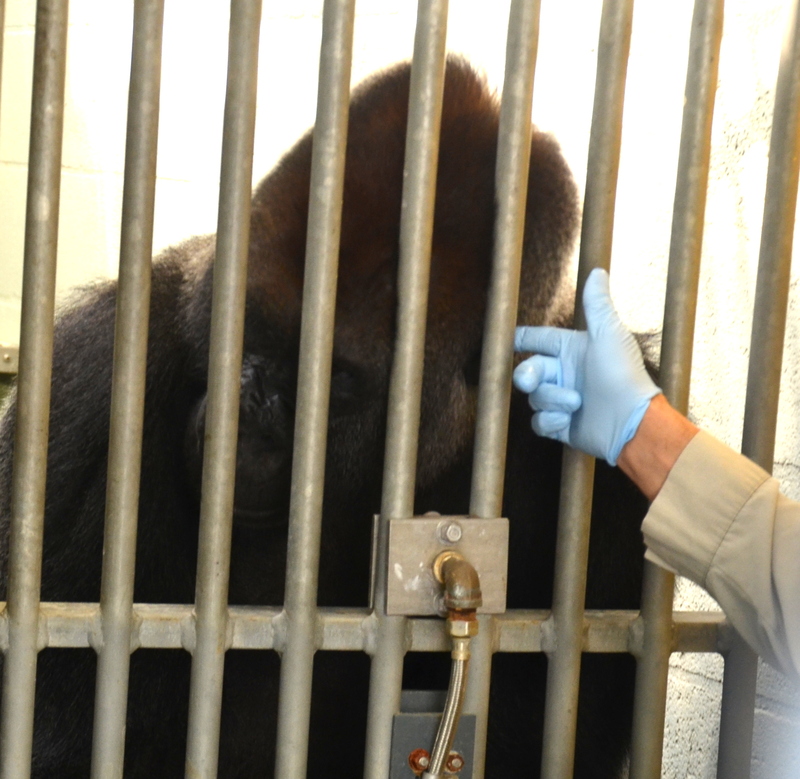 “This huge gorilla with a beautiful silverback, loves to eat raisins that the keeper throws around the free roaming exhibit for him and his troop members to pick off the ground one at a time with those huge fingers,” Rex Little, volunteer docent at the gorilla exhibit, pointed out. Then 420-pound Winston walked around and collected 15-inch long lettuce leaves then sat on a log to eat them. He was a picture of contentment, happiness and joy as he sat on the log eating lettuce and watching Monroe. 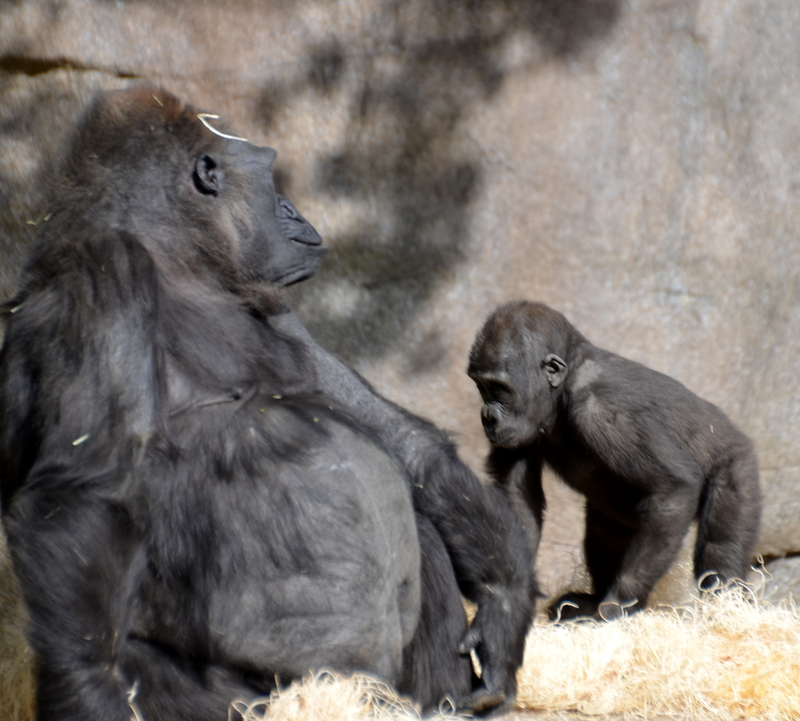 Monroe’s Mother, Kokamo, also closely watches her active baby as she goes about her daily life in the exhibit and he goes about his baby antics and is into everything. He practices pounding on his chest with his fists like a silverback gorilla does to show dominance. Monroe watches every move the adults make and then copies them. bedroom with Frank until it is their turn in the exhibit yard. Imani is included in Winston’s troop with Frank now. Gorilla females can have a baby every 4 years, and, hopefully, in the future, Monroe may get another playmate in addition to Frank. After a full day of non-stop activities, Monroe, Kokamo, Winston, Vila, and Kamilah, sleep together in their bedroom on wood excelsior and other nesting materials. 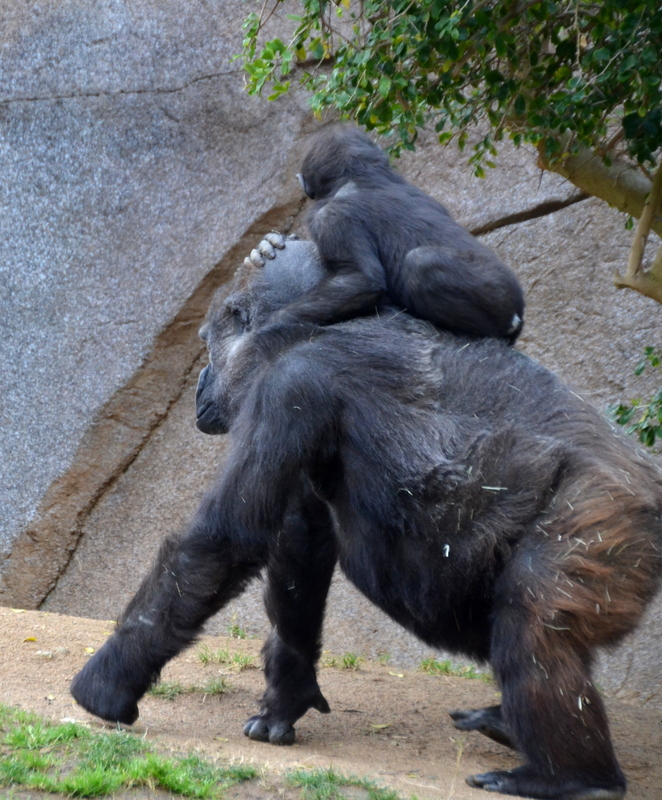 In the morning, after having their morning meal (including low starch primate biscuits), Winston, and Kokamo carrying baby Monroe in her arms, make their grand entrance into the exhibit together for the world to see the leaders of their family troop. The others follow, until all 5 troop members are in the exhibit eating their raisin treats. Monroe “playing” with an elderly family member. And they all watch Monroe and Frank while they play, explore, romp and get attention and admiration of the guests at the Safari Park while Maka awaits his next snack of banana baby food at the San Diego Zoo. It’s a wonderful gorilla life. 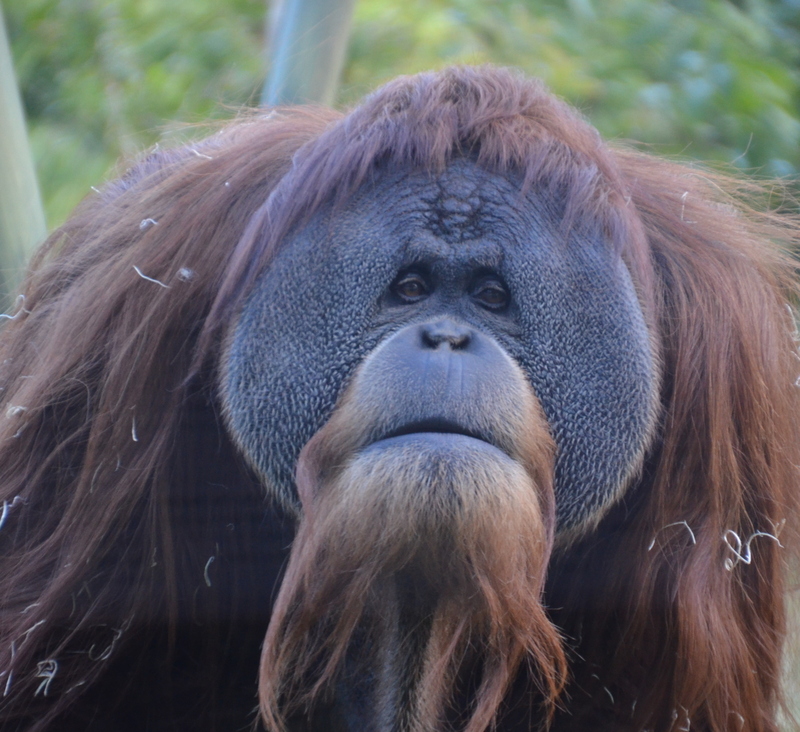 Satu, the dominant male amoung the Orangutan family, wonders what Janey and I were talking about. 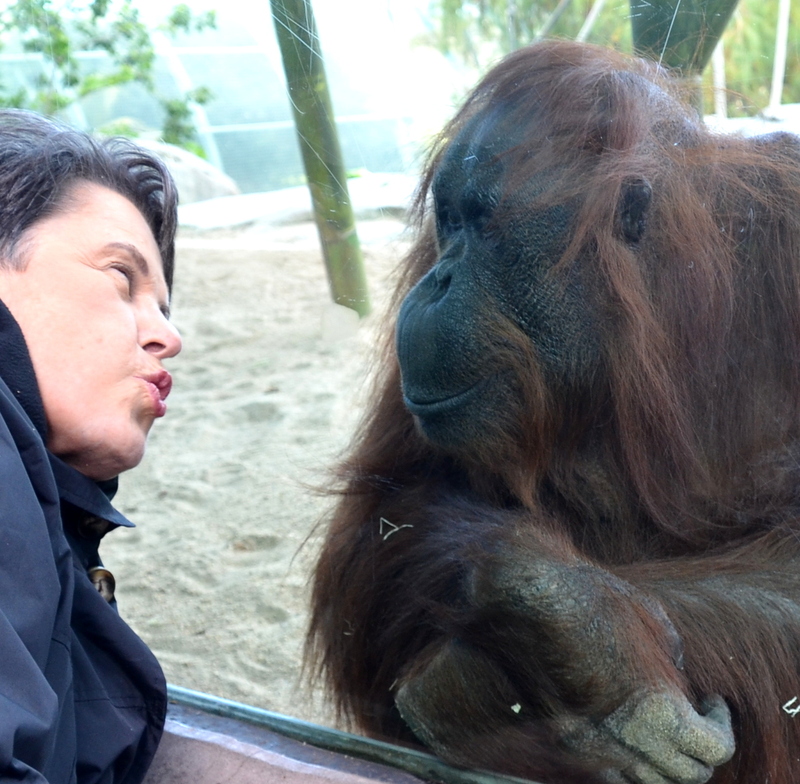 Janey and I have a conversation in the Orangutan exhibit. 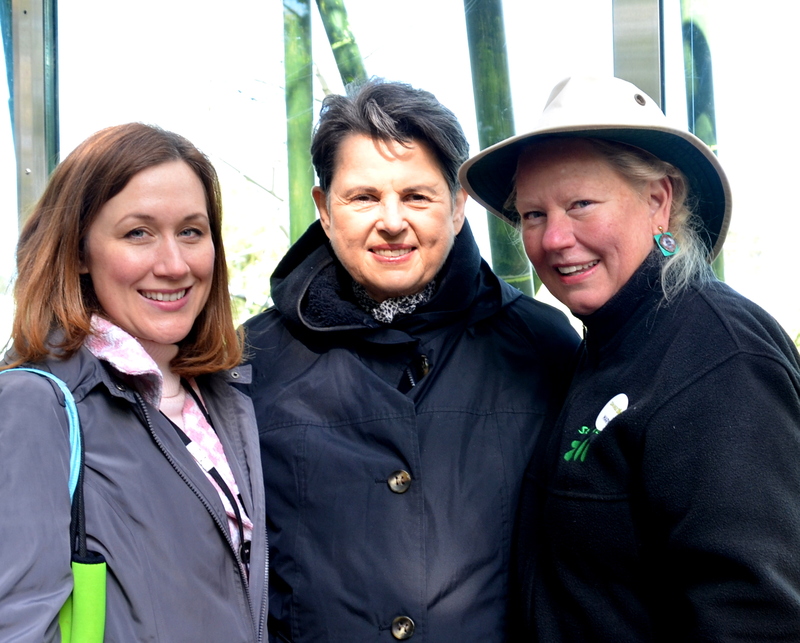 Maggie with the San Diego Zoo Global on the left and Mary Moore, volunteer Orangutan expert, on the right. 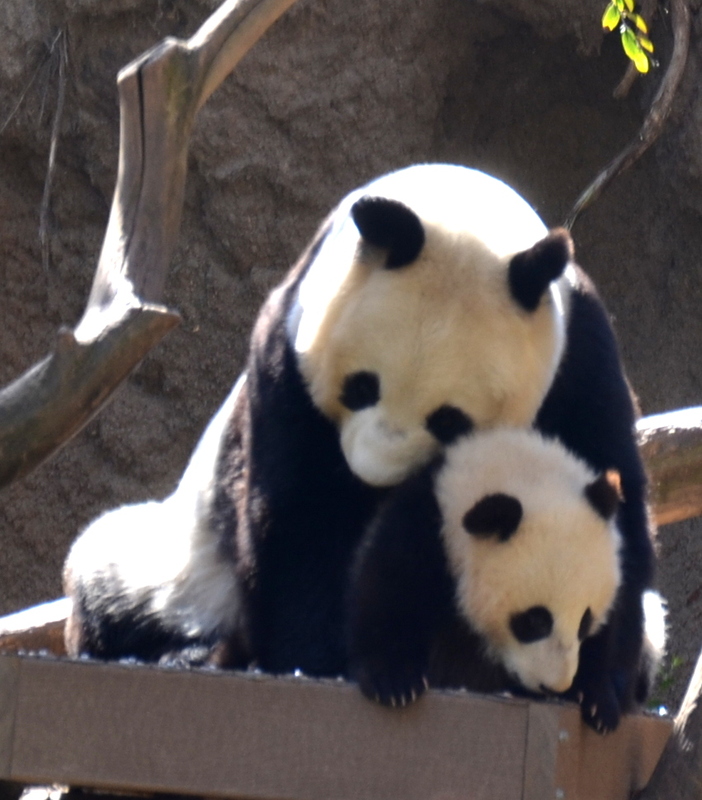 Bai Yun and her baby hugging at the San Diego Zoo. Mr. & Mrs. 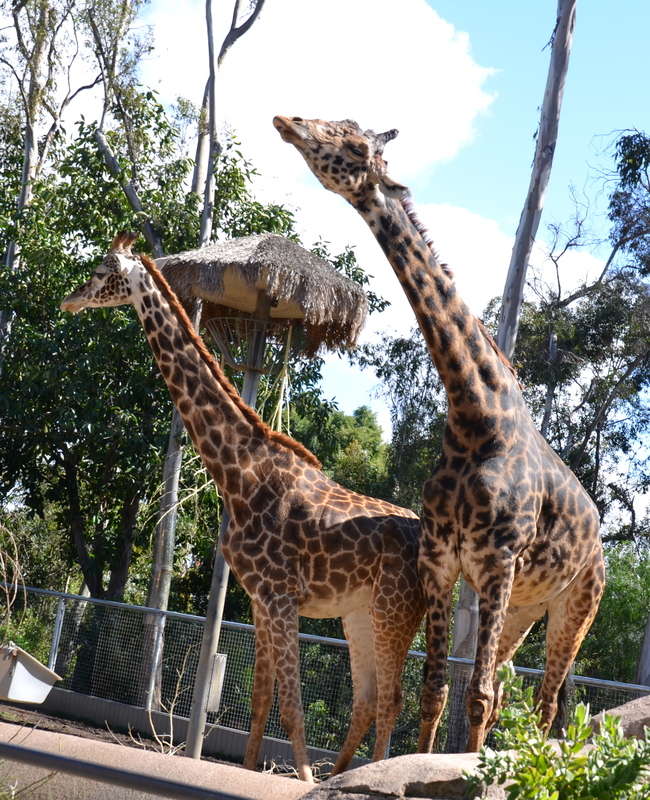 Giraffe at the San Diego Zoo. 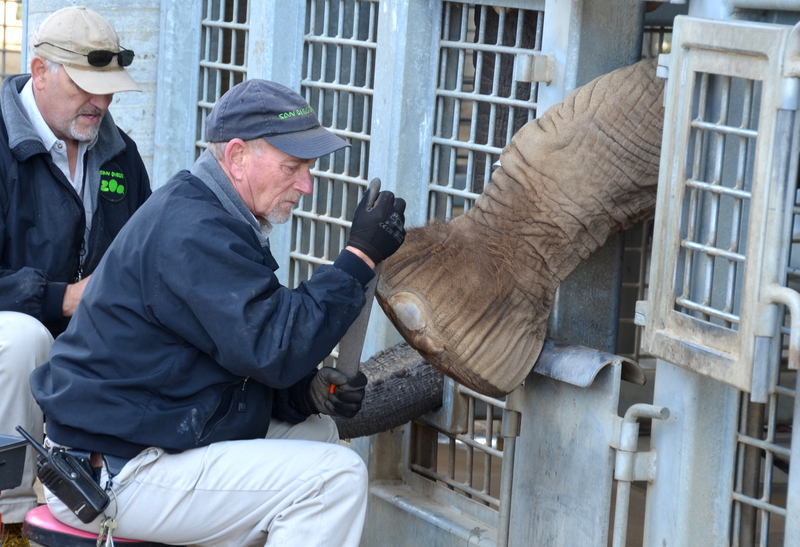 An elephant puts her foot out so the keeper can give her a pedicure. OH, what a big yawn!